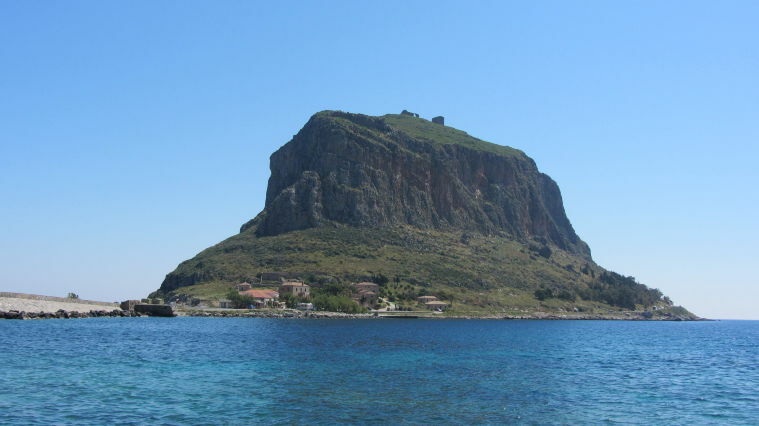 The gorgeous castle town of Monemvasia is an authentic treasure of enormous historical, architectural, cultural and geographical importance. Today, its historic churches, castle walls, low arches, vaulted passageways and its winding cobbled streets and alleys all speak of its medieval past. 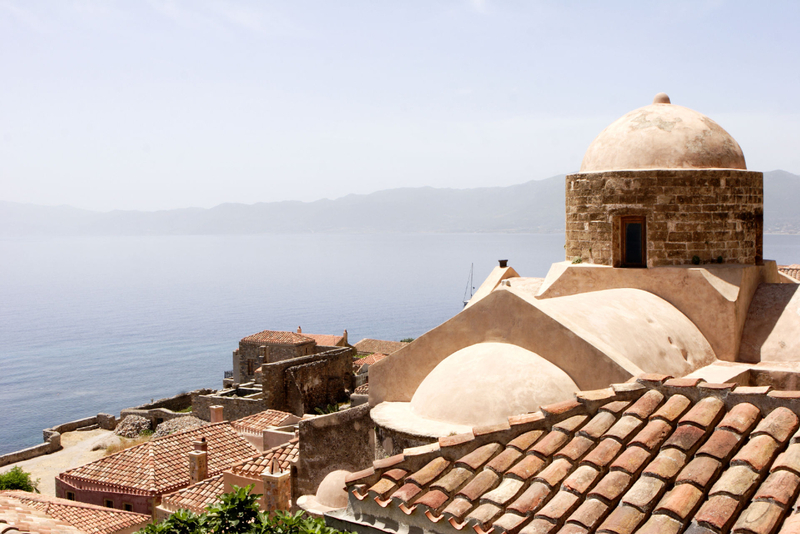 This Byzantine fortress, coveted down through the ages by all the powers around the Mediterranean: Venetians, Franks, Arabs, Saracens and Turks, stands imperiously at the entrance to one of the most enchanting corners of the Peloponnese. The medieval fortress town is only a ten-minute drive from the estate, and while there you can visit the Upper Town at the top of the plateau with its 13th Century Byzantine church of St. Sophia. You can also enjoy a special excursion with the Kinsterna boat and view the medieval fortress as pirates did centuries ago – from the sea. While staying at the Kinsterna, a truly magical experience involves visiting the 1,500-square-metre Jurassic-era Cave of Kastania, only the second of its kind in Europe and by all accounts, one of the most colourful and impressive caves anywhere – with fantastical stalagmites, stalactites and crystal formations. Getting there by car takes about 1 ½ hours, while you can also visit the cave with the estate’s boat. If your imagination is fired by mythical civilizations and long-lost cities beneath the sea, there is such a wonder to be found within a 45 minutes drive of the Kinsterna. Below the crystal-clear, turquoise waters across from the island of Elafonissos (“Deer island”) lie the ruins of the city of Pavlopetri, the oldest submerged city in the Mediterranean, while another fascinating submerged city, Asopos, lies just off the sandy beach of Plytra. You should really visit this lovely traditional fishing village set in a unique natural fjord at Europe’s southernmost tip. The landward end of the fjord comprises an important natural wetlands area, ideal for birdwatching and a favorite resting (and wintering) place for migrating birds of all kinds thanks to its shallow, clean waters and abundant food. As a unique ecosystem, Gerakas provides a safe haven for swans, mallards and many other kinds of fish and fowl. 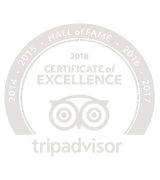 Visitors also find Gerakas a wonderful place to visit and eat, with fish restaurants and traditional cafés right on the water’s edge – and with a priceless view of both sea and mountain. And only 200 metres away lie the ruins of the ancient city of Zarakas (200-150 B.C.). East of the nearby town of Neapolis are the remains of a petrified forest by the sea, where you can still see numerous fossils and sections of ancient palm trees that turned to stone millions of years ago. A spectacular, secluded location, with many coves and beaches, this miracle of nature is listed in the Atlas of Geological Monuments of the Aegean. The last remaining water-powered mill of the 11 that used to operate in the area, the newly restored and truly functioning Talanta Mill is an exceptional example of traditional technology.  It sits in a splendid natural landscape full walnut, plane and myrtle trees, while the watermill of Vrysika, only 20 minutes from Kinsterna, is also worth exploring. 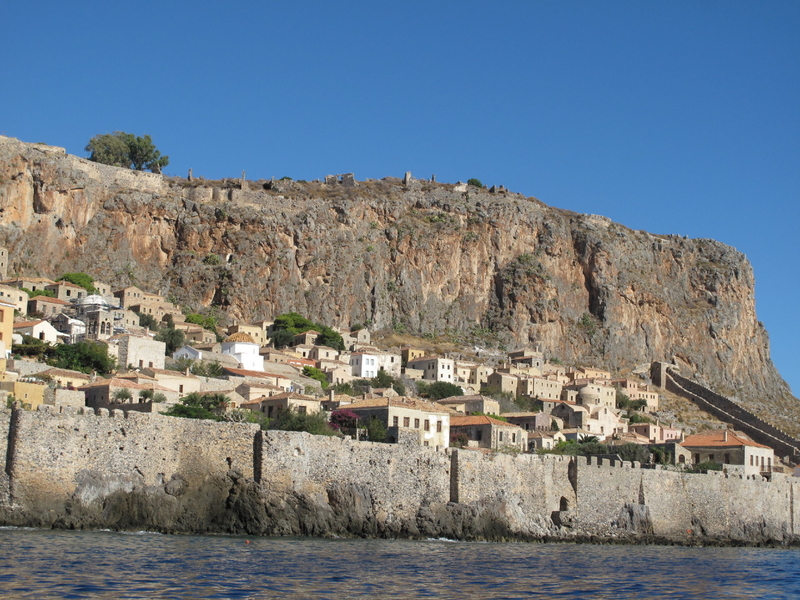 You can visit Areopolis on west coast of Mani, a very scenic drive of only 98km. An historic settlement which fiercely defended its independence under Turkish rule, Areopolis has been designated a restored architectural monument and still maintains the traditional color and atmosphere of Mani. Rock-climbing enthusiasts will certainly want to visit Kyparissi, a climber’s paradise featuring at least 15 climbing routes through vertical limestone walls, stalagmites and caves. On a small hill overlooking the traditional village of Geraki with its many splendid 12th-Century Byzantine churches, you will find a unique Byzantine fortress, hiking to which is a wonderful experience in itself. 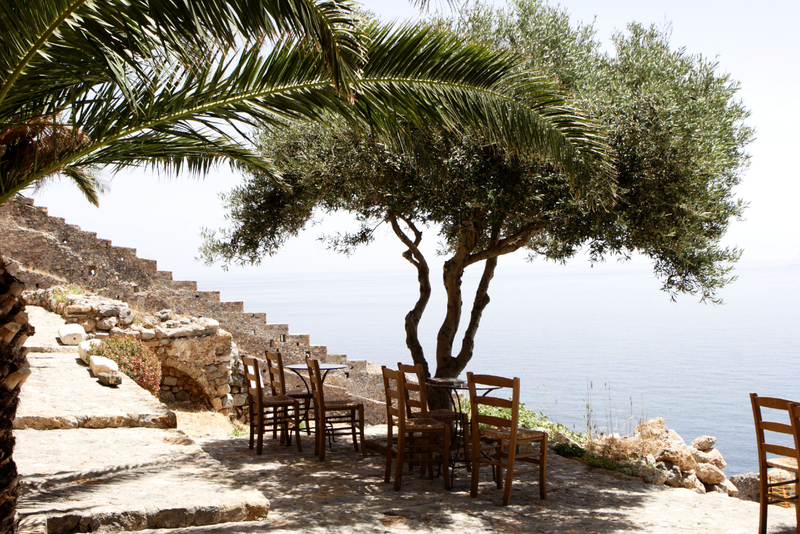 A scenic 35-minute drive from the Kinsterna mansion brings you to an old Ottoman residence (circa 1760) in the Megalo Perivoli area, next to the village of Koulentia. One can also reach the residence via an even more scenic Byzantine footpath dating from 1300 A.D. (2 hours by foot from Kinsterna). 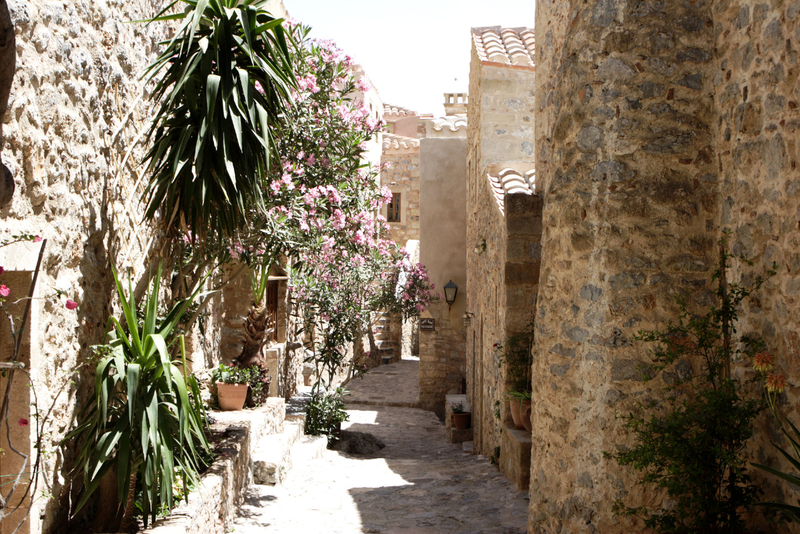 In this uninhabited settlement there are two adjoining Byzantine churches from the 13th Century, with a gushing spring in their shared sanctuary. Tradition has it that construction of the churches was begun by the daughter of Emperor Emmanuel Palaiologos. Recent restoration and conservation work has been undertaken thanks to support from the Leventis Foundation and Mrs. Haris Kalligas. From Kinsterna, Teria is a short, scenic drive (8.5km, of which 2km is on unpaved road).